It was somewhat comical to read Joe Henderson's column (or perhaps we call it his rant) in today's Tribune about CPAC, the Tea Party and conservatives. Henderson seemed to base his bashing of CPAC and conservatives from conversations with one Tea Party friend who he asked "How do you ever expect to win a national election again if you don’t work with other people and compromise when you need to?" The friend apparently replied "Why should we compromise when we’re right?" In this country, we don’t get everything we want. The disingenuousness of Henderson's column is laughable but the sad truth is the caricatures Henderson portrays is exactly what we see in mainstream (aka lame stream) reporting everyday. Perhaps Henderson should actually talk to more conservatives or those who believe in the Tea Party Principles. If Henderson just clicked on the Tampa Tea Party website, this is what he would find. Which Principle does Henderson want us to compromise on? The fact is both parties have ignored these Principles. What has been the result? Out of control spending with now over $17 TRILLION of debt and if the unfunded liabilities of entitlements are included, it's $100 TRILLION we owe. Joe, you as a citizen now owe at least $192K and your family owes almost $753K according to the US Debt clock - is that sustainable? Laws, regulations and un-elected bureaucrats abusing our individual Liberties which our country was founded on. This is what compromising principles have given us. Let's mull over Henderson's answer "in this country, we don't get everything we want". President Obama, supposedly a former Constitutional law professor, now threatens more unilateral action with his "pen and a phone" because he ignores Constitutional Governance and refuses to govern through the Constitutional legislative process. Obama complains (or whines) he must do this because he cannot get his agenda through that Constitutional legislative process. So Joe - Obama can't push his agenda legislatively and get "everything he wants" so he unilaterally dictates - are you OK with that? 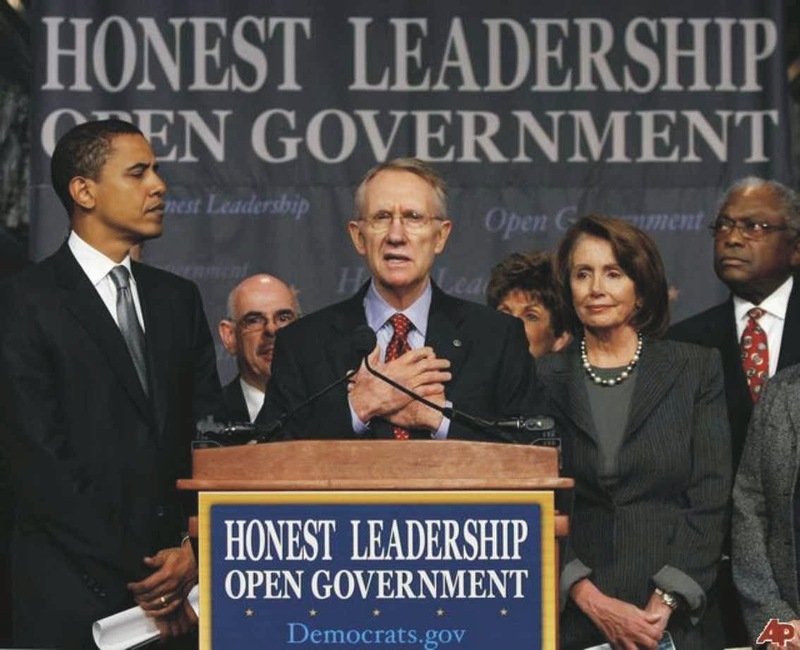 When the Democrats took both houses of Congress in 2008, did they ever compromise?Nancy Pelosi and Harry Reid refused to allow amendments on Obamacare or much anything else from Republicans to even be brought forward for a vote. They rammed Obamacare through using back room bribes and special procedures. In other words, even having majorities in the House and Senate, the Dems could not get "everything they wanted" without resorting to these tactics. Pelosi and Reid even refused to pass a budget which they are lawfully required to do because they knew they could not "get everything they wanted". So Joe - are you OK with that? Republicans took the House back in 2010 because of the Tea Party leadership and influence. The House passed budget after budget and sent to the Senate. Again, Harry Reid refused to pass a Senate budget required by laws passed by Congress itself. Reid is again refusing to pass a budget for 2015 because Reid knows he cannot begin to get "everything he wants". So Joe - are you OK with that? Why isn't the media holding these elected representatives accountable? Is it the media's job to regurgitate Democrat talking points and then tell conservatives to compromise? Senator Harry Reid, McCarthy like, recently takes to the floor of the Senate to call Americans and his own constituents liars and that all those horror stories coming out about Obamacare "are all lies"
Senate leadership, as far back as 2010, was urging the IRS to target your fellow citizens, conservative 501c4 groups because of their political beliefs. Former Secretary of State Hillary Clinton testifying in Congress on Benghazi stating "What difference does it make"
The Tea Party ignited on and always has focused on fiscal issues and fighting to return our country to Constitutional governance. We have endured name-calling from Democrats, including Democrat leadership, and from the media's false portrayal of who we are and what we represent. We could go on and on documenting the false, absurd, stupid and ignorant statements Democrats and the media have made about Americans who believe in the Tea Party Principles. We certainly have never heard Henderson accuse the Democrats of saying so many "stupid things". But perhaps Henderson could start in our backyard with this comment made during a debate from CD 13 candidate Alex Sink on immigration. Does Henderson think that comment was "stupid"? Or would he only have mocked it as stupid if a Republican had said it? And the Democrats are so diluted of any new ideas and leadership, they have to run a retread Republican flip flopper, who has become an unprincipled career politician, for governor. The Tribune and local media will not report on Charlie Crist's inconsistent positions that bend with the wind. And Joe - Where are Senator Nelson and Rep. Kathy Castor on the Obamacare train wreck? Senator Bill Nelson echoed Obama's lie about we all get to keep our healthcare. Both are MIA - Missing In Action on Obamacare. We're anxiously awaiting Joe's column asking them: What do they propose to do to fix the mess and do they support the President unilaterally making changes usurping their power? The Tribune has repeatedly reported and editorialized on delaying flood insurance reform. Yet the Tribune has avoided reporting Nelson actually voted FOR the original bill to raise federal flood insurance rates. Joe - why aren't you and the Tribune holding Nelson to the same standards? Henderson mocks that there is actually debate and true "big tent" inclusion within the Republican party. Isn't that a good thing? The moderate or conservative Democrats are on life support because the leadership is now so left-wing Progressive that their modus operandi is to shutdown all dissent. While Henderson makes caricatures out of those speaking at CPAC, those who support Tea Party principles and conservatives, the truth is the Democrat party is now being led by cartoon characters. Do you think we'll see a Henderson column about the Democrat cartoon characters soon? In this Orwellian world we find ourselves in, somehow the Tea Party and conservatives are the problem? Same ol' stuff from Joe. But Joe - All Americans deserve better from our politicians. All Americans deserve better from our media.